The VX Limited was a version of the Land Cruiser 80, the 1989 reboot of the famed Toyota vehicle. Lucky owners of the VX Limited enjoyed the smooth drive provided by its 165hp 4.2-liter inline-six turbocharged diesel, combined with a 4-speed automatic transmission and full-time 4WD with center differential. The coil-sprung suspension offered equally impressive performance both on and off the streets. This kit depicts the car with after-market option parts such as roof rack, roof-top auxiliary lamps, as well as large diameter tires, for an altogether sporty image! 笘�This is a 1/24 plastic model assembly kit. Length: 224mm, width: 87mm. 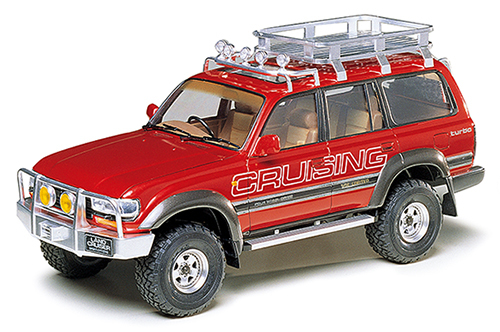 The Land Cruiser 80 is accurately depicted, complete with a number of option parts. 笘�Numerous metal-plated parts are used, to recreate front fender, roof-top auxiliary lamps, roof rack, rear ladder and wheels. 笘�Clear hood parts allow appreciation of the detailed rendering of the engine, even after completion of assembly. 笘�The ladder frame, plus front 3-link and rear 5-link suspension setup is authentically depicted, using metal coil springs for realistic movement. 笘�Instrumentation and steering wheel parts are included to create the model as left- or right-hand drive. Information is correct as of June 15, 2015. Specifications are subject to change without notice.